The Ladakh region is home to an array of Tibetan Buddhist monasteries, whose foundation was laid by the Ladakhi kings and Buddhist saints. 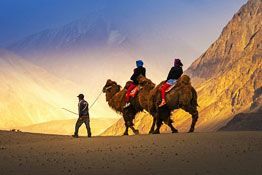 This Spiritual tour of Ladakh, which stretches itself in 6 nights and 7 days, has been designed to let you explore beautiful and vivid monasteries that offer a sneak peek into the Tibetan culture and history. You will be exploring monasteries like Takthok, Hemis, Chemrey, Ridzong etc. out of these, Hemis is an important once since it is the richest and the largest monastery of the region. if you are keen to know about Tibetan culture, then you will enjoy a visit to Choglamsar (SOS village) on day 2 of the tour. Upon your arrival at Leh Airport, our tour representative will meet you and assist you in smooth transfer to the hotel. The day is kept free for acclimatization. Stay overnight in the hotel. The morning is free to relax. In the afternoon, hit the road to Saboo, which is around 8 kilometers from Leh and nestled atop of a hillock facing the Indus Valley. 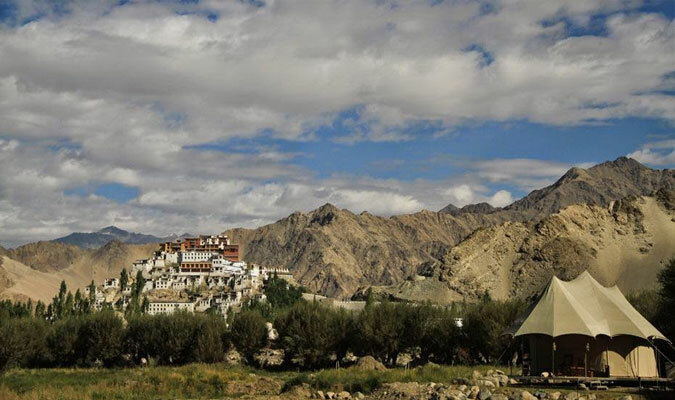 It is the most visited monastery in Leh. On your way back to Leh, visit the SOS village (Choglamsar). It is an important destination for those who are interested in studying Tibetan culture. The Central Institute of Buddhist Studies located here features a Tibetan library, handicraft shop, restaurants and medical center. There is also a golf course and a polo ground. Day 3 starts with an early morning visit to Takthok Gompa. Built in the 8th century by Guru Padmasambhava, Takthok Gompa is situated around the cave where he meditated. Post your return from Takthok Gompa, set off to visit the Chemrey Gompa. Built under the patronage of Sengge Namgyal,the construction of Chemrey Gompa was started in March 1644 A.D. and got completed in 1646 A.D. This monastery is nestled atop of a small hill, whose one side is a dwelling of monks. Later, hit the road to Hemis Gompa, which crosses the Indus River at the Karu Village. Built in the 17th century, between 1602 A.D. TO 1642 A.D., Hemis is one of the most famous monasteries in Ladakh. It is also known for the annual festival called Hemis Tsechu. In the evening, return back to the hotel for dinner and overnight stay. Post breakfast, take a road journey to Alchi. On the way, halt at Phyang Gompa, located on the main highway to Alchi. 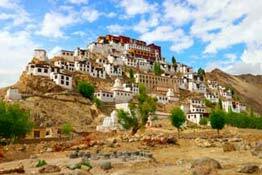 It is one of the most beautiful monasteries in Ladakh. Post sightseeing in Phyang monastery, visit Basgo, which is located along the road to Alchi. When the kingdom of Ladakh got divided in the 15th and 16th century, the Basgo village was an important tourist center in the medieval times. In the afternoon, visit the Alchi Gompa. It is a temple complex located within the Alchi village and dates back to the 11th century. It exhibits a seamless blend of Indian and Kashmiri architecture. It is the seat of the Ngri Rimpoche, whose incarnation in embodied in the younger brother of the Dalai Lama. Stay overnight in the hotel. While returning back from Alchi to Lamayuru, pay a visit to Ridzong Gompa, one of the less visited monasteries in Ladakh. Built sometime around 1840, this Gompa is beautifully set in a valley, in a gorge and was founded by Lama Tsultim Nima. After exploration of Ridzong Gompa, proceed on a trip to the 11th century Lamayuru Monastery. There is a popular legend that the Arhat Madhyantika, a disciple of Buddha, offered holy food and water to satisfy the spirits inhabiting the Gompa. Stay overnight in the hotel. Today, you will drive back to Leh for lunch at the hotel. The afternoon is free for leisure. Stay overnight in the hotel.